Bobbin Trace, Bobbin Mill Woods, and Bobbin Brook (collectively the Bobbin neighborhoods) have enjoyed strong home sales in 2015. This year actually ranks as the best in the past ten years (based upon the number of homes that have sold), and the level of home sales is consistent with the number that sold during the strongest years of 1998 though 2005). In other words, these luxury homes have sold at a high rate this year in the Bobbins. But unlike other neighborhoods that have posted strong sales, it appears as if the run has stopped cold right now for the Bobbins. Eight homes remain listed for sale, yet none of them are under contract. This is definitely contrary to what other highly active neighborhoods are showing. 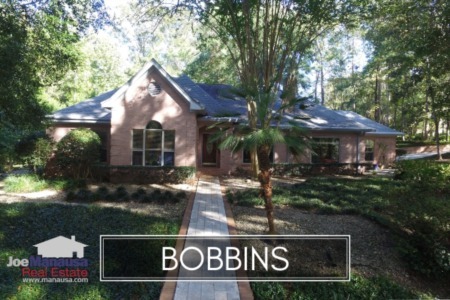 You can see it all right here, from the current Bobbin listings in the Tallahassee MLS to all past home sales going back to 1991. Additionally, we provide updated graphs featuring average home price trends, average home value trends, and average home size trends in the three Bobbin neighborhoods. It is important to note that the narrative contained below is for sales through December for all previous years, but through the fourth week of December in 2015 (though it is not likely we will see any more home sales here this year). 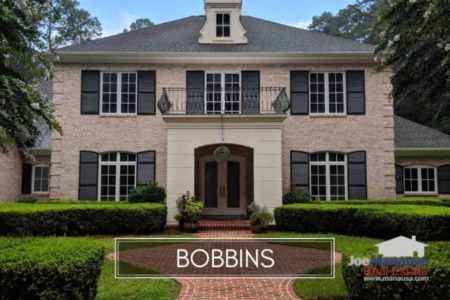 The graphs and the closed sales table will be continuously updated into the future (meaning bookmark this page if you always want to know the current status of homes in Bobbin Brook, Bobbin Trace, and Bobbin Mill Woods). Average home prices fluctuate wildly in these high end neighborhoods due to the few number of homes selling annually. When one of the larger homes sells (for over $1M), it has a large impact on "average" prices. This is why we advise you use these reports to get a general feel for trends, but rely on your real estate buyer's agent for specifics if you are planning a move here or your listing agent if you are planning a sale. The average recorded sales price through late December has been $624,200 for Bobbin Brook, Bobbin Trace, and Bobbin Mill Woods, with 14 homes already sold and closed. Low interest rates continue to make these homes affordable, which explains the current high rate of sales. Average home values in the Bobbins vary greatly due to the low liquidity of high end home sales combined with the varying relative age of the homes. 2015 represents the third consecutive year of declining values, so this is not a trend to be taken lightly. As with every price range and neighborhood, we look to supply and demand to forecast the future. Currently, there are 8 homes for sale in Bobbin Brook, Bobbin Trace and Bobbin Mill Woods collectively, and none of these are already under contract. Considering the strong rate of sales up to this point, I suspect it means current sellers have priced themselves out of the market at their current asking prices. Thus far in 2015, the average value of a home sold in the Bobbins has been $156 per square foot. The average home size sold in the Bobbins typically falls in a range of 3,500 to 5,000 square feet, and 2015 is falling well within this range. The 14 Bobbin neighborhood home sales in 2015 have averaged 4,059 square feet. The following list of homes are the most recent listings in Bobbin Brook, Bobbin Trace, and Bobbin Mill Woods. The following list shows home sales in the Bobbin neighborhoods going back to 1991. I hope you enjoyed our December 2015 update on home sales in Bobbin Brook, Bobbin Trace, and Bobbin Mill Woods, please feel free to drop me a note if you have questions not covered in this report.